This is a topic that I first read about in Robert Kiyosaki's book 'Rich Dad, Poor Dad'. His book is enlightening in many ways and the famous quadrant in his book says that only those on the right hand side can become rich. According to the book, those people who work very hard at their jobs and do not develop any of the other streams of income will be destined to end up either poor or penniless. So do you want to end up poor or rich? Thus, it is important to develop your other income streams, either through starting a company and/or through investment. Most people will not start a company in their lifetime, but EVERYONE can be an investor. 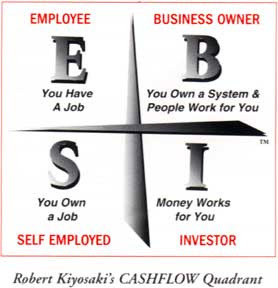 So looking at his quadrant, a person who makes sure that there are streams of income coming from all four areas preferably will be better off than a person who just does his or her job diligently. I know of people who thinks that putting money in stocks and shares is very risky and refrain from investing. Their idea of investing is just putting the money in the bank and earning slightly higher interests from fixed deposits. So they are solely in the top left quadrant. Sadly, they are likely to find themselves in a bad situatio when they are nearing retirement. Here in Singapore, you see people who are already old working hard at their jobs. Some may be because they want to keep themselves occupied, but many of them are working because they know that their money will not be able to last them through their final years, so they have to work till they cannot. So how do you start getting multiple streams of income? First, you need to work for someone to gain experience and savings to do other things in the quadrant. The second thing you will need is to be in the investor quadrant as soon as possible. Those who just started work should put aside at least $100 every month into investments, if not more. Getting a good unit trust and buying using dollar averaging method is a good start. Then you can look at buying stocks and shares after one year. You should also be thinking of getting property to use as rental income to add yet another income stream. After a few more years, you can consider becoming either a business owner or being self employed. And you will be on your way to having multiple streams of income.